The honeymoon never ended for polar bears Talini and Nuka. Talini, the female, was born at the Detroit Zoo in 2004, and the staff has watched her grow from infancy up to 650 pounds. Nuka, her mate, was brought from Pittsburgh in 2011. The Association of Zoos and Aquariums made the match based on the bears’ ages, lineage, and other factors. Their luxurious suite — in the state-of-the-art 4-acre Arctic Ring of Life — also houses seals and arctic foxes, and includes a 190,000-gallon chilled saltwater pool. Daily room service includes a menu of fish, apples, pears, carrots, sweet potatoes, and specially formulated polar bear chow. Polar bears (Ursus maritimus) are found throughout five polar nations in the Northern Hemisphere and can grow to be up to 9 feet tall and 1,400 pounds. Unfortunately, their massive size didn’t help keep them off the “threatened” list under the U.S. Endangered Species Act. The worldwide population has dropped to fewer than 25,000 largely due to the thawing of arctic areas, as the bears rely on ice to hunt, breed, and sometimes to den. Luckily, the future is bright for the happy couple. 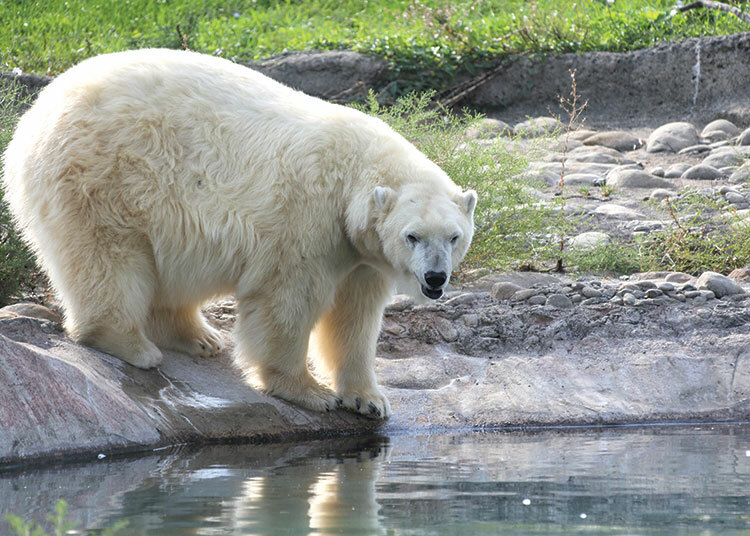 Talini is one of only 11 polar bears nationwide recommended for breeding. So with any luck, there may soon be an addition to the family.